=SUM(number1,number2, …)number1, number2, … are 1 to 255 rows for that you want to get the total or sum.There are four ways to calculate total of numbers within given range (more than one continuous cells). 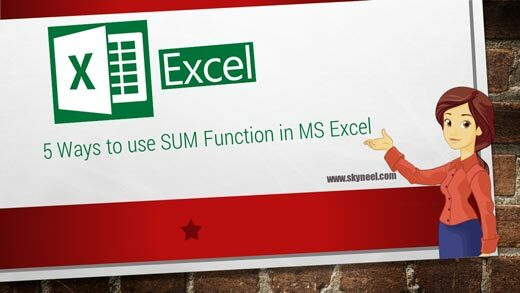 Note: Each formula in excel always started with equal sign (=) operator, without using this sign you are not able to view the result of any formula in MS Excel. Method 3: You can use Auto Sum from the Home Tab, first place the cursor on which you want to total then you have click on this button, and then press enter key to view the result. Method 4: You can use short cut key combination (ALT + =) to calculate the total of all the numbers within given range of cells. Method 5: You can click Formula Tab -> Insert Function -> Choose Category Math & Trig -> Choose Sum Function -> Type the numbers in given box which you want to add then click Ok.